See Oslo's top sights on a full-day combo experience in the Norwegian capital. With a guide, take a sightseeing tour by coach, visiting Vigeland Park and stopping at the famous Holmenkollen Ski Jump for photos. Tour the Open Air Museum and enjoy your choice between the Kon-Tiki Museum or the Fram Museum. Then head out into the Oslo Fjord to enjoy a cruise around the idyllic coastal region. Greet your guide at Oslo City Hall and climb aboard a comfortable, air-conditioned coach to begin your sightseeing tour of the city. Stop first at the renowned Vigeland Park, a verdant expanse that immortalizes the work of iconic sculptor, Gustav Vigeland. Stroll amid more than 200 bronze and granite sculptures before enjoying a photo stop at the Holmenkollen Ski Jump, the vertiginous slope used in the 1952 Winter Olympics. Travel onward to Bygdøy Peninsula, a charming city neighborhood that boasts some of the city’s most influential museums. Take a tour of the Open Air Museum; Norway's largest museum of cultural history and one of the oldest open air museums in the world, featuring an iconic, world-famous stave church built in the 1200s. Then, enjoy your choice between a visit to the Fram Museum or the Kon-Tiki Museum. At the Fram Museum, see the polar ship Fram, a wooden vessel that traveled along the Arctic Sea in the late 1800s. Take a tour of the powerful schooner — the first boat to reach the South Pole — and learn about life at sea in the harsh polar conditions. Alternatively, delve into the intrepid explorations of Norwegian explorer, Thor Heyerdahl, at the Kon-Tiki Museum. 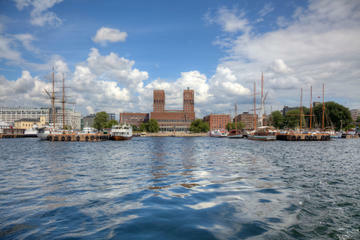 Afterward, take a short stroll to the pier to board your sightseeing cruise around the beautiful Oslo Fjord. Seat yourself in the warm, covered deck and admire the idyllic bays and beautiful islands that decorate the fjord. Listen to onboard commentary from your guide and then return to the dock after two hours. Return to the tour’s original departure point. The tour itself was pretty average. There was not enough time at each stop . Partly because of the number of people . It was a double decker bus filled to absolute capacity . So if you hate huge crowds, pay the extra and go for the smaller tour. This really was the perfect way to get acquainted with Oslo. The tour by bus and then by boat makes for a very long day, but an educational and enjoyable one. It was easy to find the tour bus and our guide was very informative. There is so much to see in Oslo and several days is way insufficient, but if like me you only have one day, this 7 hour tour of some of Oslo's highlights is the perfect way to do it. The guide was knowledgeable and friendly and when next I go back I will know where I want to spend more time. I was EXTREMELY DISAPPOINTED with this tour!!!! First off, I was under the impression that the tour was going to be a small group tour, maybe 16 to 20. We were put on a double-decker bus!!! about 60 people in the group!!!! That is NOT a small group!! While we were on the bus, we had headphones to hear the guide, but when we were in the Viking museum, we did not have ear phones! The museum was packed and there was NO way we could hear what she was saying! I booked this tour because of the description of small groups! If I wanted to be in such a large group, I would have booked thru Princess Cruises! It was very nice. Everything was on time. The guides were also very good. I recommend this tour to families with kids as well. Thank you. We booked this tour after an 8 day trip through Norway with a small group. This was a good tour and hit the highlights of Oslo. Our only complaint is that the group was quite large. There were two large double decker buses each with its own guide. The guide was very good though and did a good job keeping the group moving as this tour includes many sights. Great tour. It cover's everything with enough time to get an ice cream! The boat tour doesn't go that far into the fjords. It's still a nice end to the tour but don't think you are going to go deep into the waterway. It is definitely a full day. Great package! Very complete trip with all the best highlights of Oslo.